Last Saturday, Eugene and I went to his parents' house for dinner. I woke up with some vague plans to make something to bring, but got caught up working on a few projects and so it wasn't until late in the afternoon--about one hour before I had to start getting ready--that I decided. "I'm going to bake a cake!" I told Eugene, who looked at the clock with horror. Don't worry," I assured him. "I'll be ready." I knew my mother-in-law was making lamb, so I decided to do something with slight middle eastern flavors. 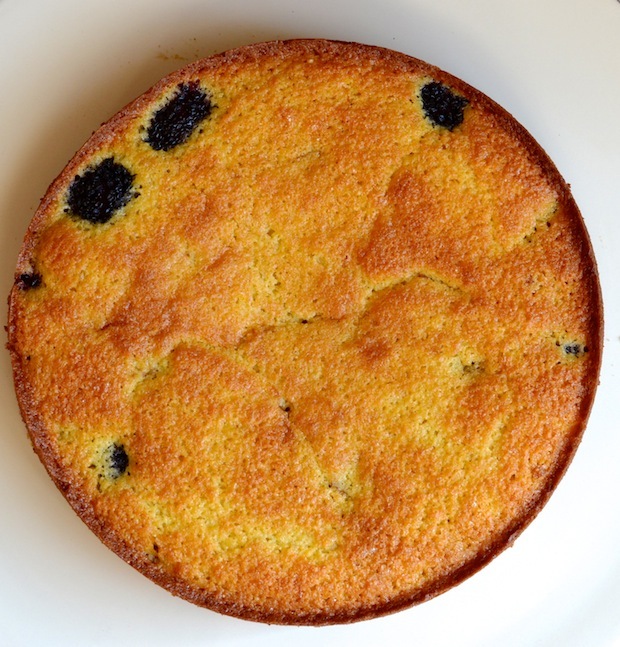 Hence, this Blackberry Saffron Almond Cake. 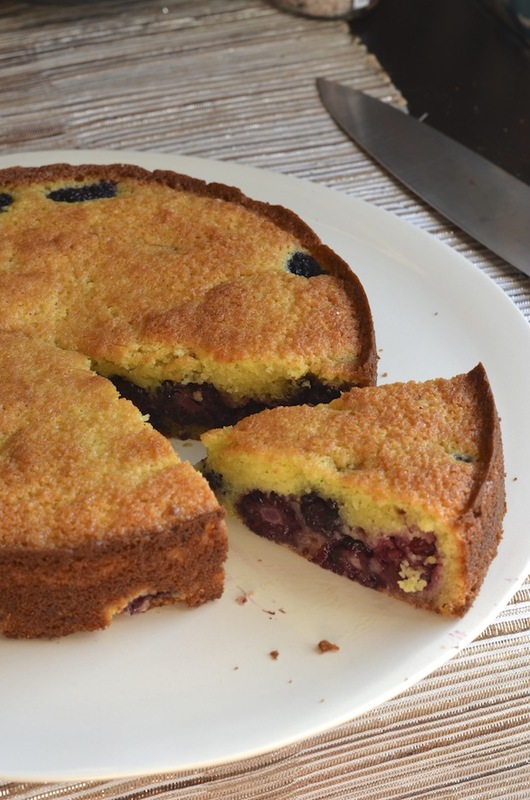 It's a simple cake--an easy golden batter that is then poured into a springform pan and filled with berries. 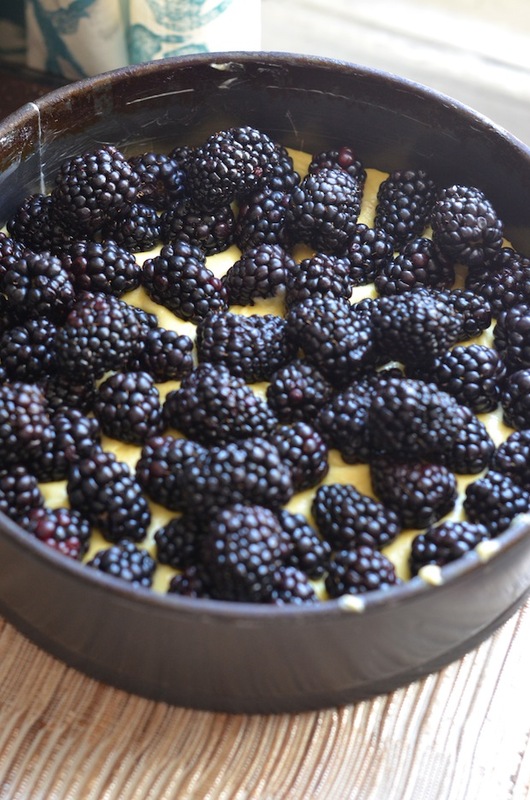 I've really been loving blackberries this year--big and plump with the perfect balance of tart and sweet. 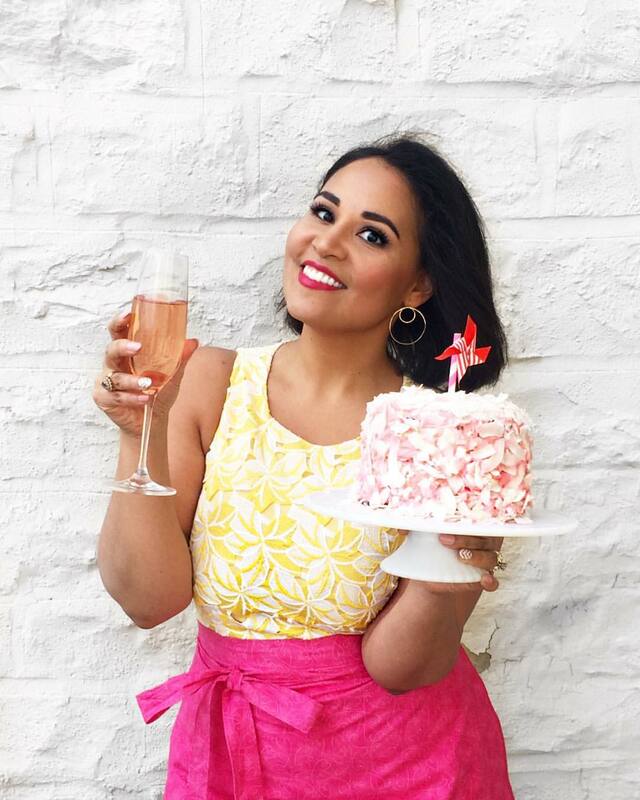 As simple as it is to make the cake, the results are anything but boring. Scented with a heady mix of fragrant saffron, almond, and citrus, it's a sophisticated cake that's elegant enough to serve for company, but also equally lovely served with an afternoon cup of tea or as a sweet ending to breakfast. The specialness is all in the saffron, which I really urge you not to skip. I know saffron can seem like a splurge, but the reality is that you really only need a pinch of it for this cake (and for any dish that calls for saffron). One jar (typically priced between $4 - $10, depending on where you shop) is often enough for 5 or 6 different recipes, and the flavor is such that it really makes an impact. You'd probably spend more on a random bottle of wine or a deli sandwich! And, because I know people will ask, this cake is definitely customizable! Swap out the blackberries for raspberries or cherries. In the summer, peaches and plums will work beautifully. Or you can even keep it plain, perhaps with a sprinkle of almonds on top. P.S. Did you hear about my 3-day culinary retreat in June? Click to learn how you can join me for this all-inclusive weekend of amazing meals, cooking demos and workshops, yoga, shopping, massage, and more! Rates start at just $585 per person. Click for details. Preheat your oven to 350 degrees F. Grease a round 9-inch springform pan and line bottom with a round of parchment paper (this will help keep the berries from sticking). If you don't have a springform pan, you can use a regular 9 or 8-inch round cake tin as long as it has high sides (at least 2 inches), though note that you'll have to flip it out and then flip it again when cooling. Sift together flour, almond meal, baking powder, and salt in a small bowl and set aside. In the base of an electric mixer, beat the softened butter and sugar for about 3 minutes, until light and fluffy. Beat in the eggs, one at a time, waiting until each is incorporated before adding the next. In a small saucepan or the microwave, heat the milk and saffron threads just until it bubbles, then remove from heat and let steep 5 minutes until the milk turns a deep saffron yellow. Let cool slightly and then pour into your batter along with the lemon zest and almond extract. With the mixer on the lowest speed, add the flour mixture and mix until well blended. Spread the prepared batter into the springform pan and smooth out the top. Arrange the berries in concentric circles. Use all the fruit, even if you have to layer some on top of each other to fit (the fruit will sink during baking). 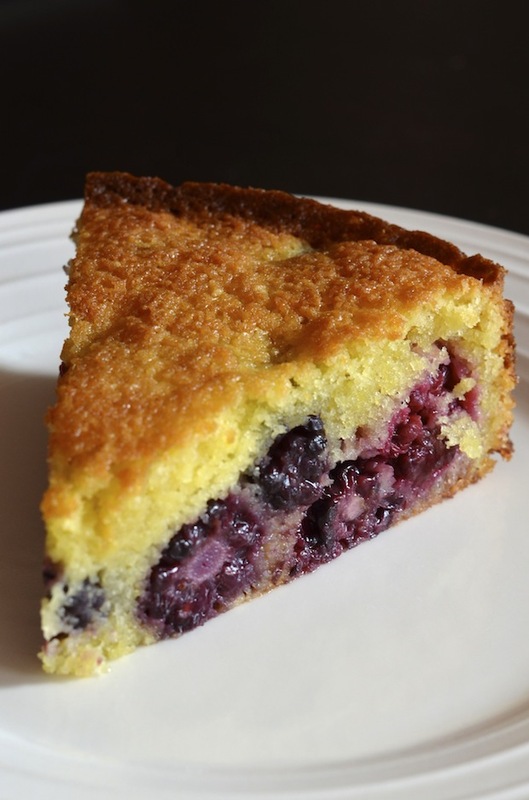 Bake in oven for 45-55 minutes, or until a tester inserted into the center of the cake comes out clean. Let cool in pan 5 minutes, then remove sides (or flip out and then over again if using a regular non springform tin) and let cool completely at room temperature before serving.